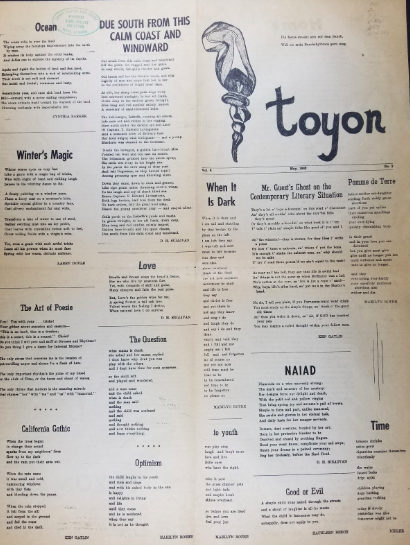 1969 In this year, Toyon published an especially controversial issue as its 16th edition. Later, an article by Barbara Kelly written in 1991 reflected on this issue and the cover design that prompted debate. The full article by Barbara Kelly is available here, courtesy of the Humboldt County Historical Society and the Humboldt Historian. This is the only volume of Toyon to not have been distributed. 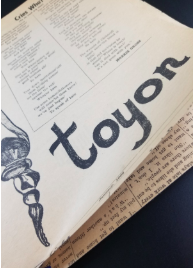 During the spring semester of 2018 the Toyon office received a letter from an individual who was on the staff that created the 1969 volume and gave an anecdote about the only example of censoring of a volume of Toyon in the journal's history. Find out more about the 1969 issue. 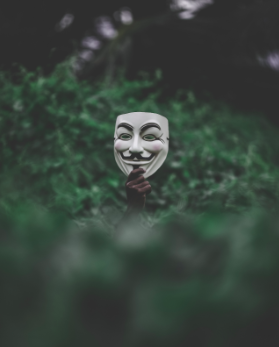 ​Within the pages of the 19th volume of Toyon, published in 1966, are three peculiar poems archived as “Anonymous, none.” While "Anonymous" signifies the name of the author, or lack there of, "none" denotes the title of the entry. All the "Anonymous, none" poems wrestle with dark emotionality and unpack traumatic events. It is understandable wanting to publish pieces that are touchier in subject anonymously, but why not title them? With such rawness and anonymity of each piece, it calls to mind a famous quote by Virginia Woolf, who states: “for most of history, Anonymous was a woman.” Could these writers be women or part of another marginalized group who just wanted their story to be told without fear of repercussion? It is hard to say. All of us at Toyon appreciate the boldness of these writers, while we do not accept Anonymous submission anymore, pen names are welcome. The “Anonymous, none” might be untraceable in name, but their words live forever in our history. V for Vendetta mask. Current representation of anonymity in our popular culture. 1964 This volume’s statement of intent shifts the focus away from simply presenting student works to “[provide] the challenge of publication and develop...a sense of responsibility to an audience.” This demarcated one of the first of many transitions in how publishing, writing, art, and the meaning of what Toyon is for students of Humboldt State University. 1963 Raymond Carver served as the editor-in-chief for volume 9, published this year. The issue included the following mission statement: Toyon exists to encourage original literary interest among students at Humboldt State College by providing the challenge of publication and developing in the beginning writer a sense of responsibility to an audience. Richard Cortez Day became the faculty advisor with this issue. Mr. Day would later come to have a fiction award named after him. 1962 Volume 8 of Toyon put out two issues in the year 1962. The first was released in January, followed by issue two May. This volume was printed in the format of a newspaper. The issues were printed on both sides of single papers, now yellowed with age. They still fold up into fourths the same way newspapers do. On the front, upper right side of the paper is where you can find the nameplate. Both issues have the publication's name and a graphic design that looks like a torch, along with the date volume and issue. Besides this information, no other front matter is provided. The issues are consistent with this minimalist design in their back matter as well. Both issues have a newspaper masthead near the bottom right corner of their back pages. These include the mission statement, and list who held the editorial positions. Wasting little space on those items provided Volume 8 with more space for works. While both publications seemed to dedicate the space evenly between prose and poetry, they differ in that with issue two, the front page was exclusively poetry while the back was mostly prose. Although several volumes of Toyon have experimented with form in some way or another, no volume before or since volume 8 has looked anything like it. It is puzzling and somewhat frustrating that there is no reference to or hint at reasons for this brief experimentation with format in the preceding or following volumes.